This series constitutes a manifesto for applied UX strategy—how to make a UX strategy work on all three levels: operational, tactical, and strategic. In the earlier parts of my series on applied UX strategy, I described the UX maturity model shown in Figure 1, the product designer’s role, and platform thinking as it applies to design delivery. Collectively, this series constitutes a manifesto for applied UX strategy—how to make a UX strategy work on all three levels: operational, tactical, and strategic. Now, we need a design team to make all of this work. How can a design team be most effective on an operational level and achieve tactical wins, so a company can achieve its strategic goals? Half a decade ago, I would have written about a work process: what activities should happen, so designers could understand what to do and how to do it, then deliver their design solution to a development team and control implementation quality. However, the last decade has been all about agile and Lean, meaning the assembly-line approach is over. The goal of our job is still the same—to understand user needs and find a good product design solution to fulfill them. But the way in which we engage in the product-development process and our mindset have changed radically. Approaches to collaboration change constantly, as we try to make them fit a specific project or task. We can no longer battle for the one perfect design process. 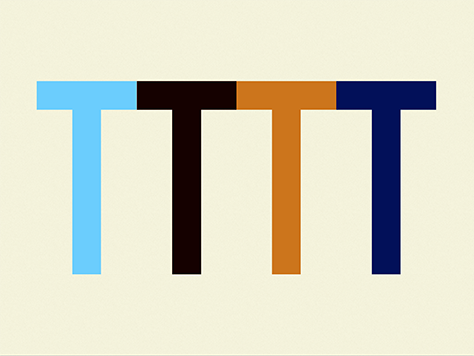 We have to be responsive—just as the modern Web is. To achieve truly groundbreaking results, we have to rely on shared values rather than procedures—values that we share with our entire product team. We have to be responsive—just as the modern Web is. To achieve truly groundbreaking results, we have to rely on shared values rather than procedures—values that we share with our entire product team. teams—Who is there and how is it organized? leaders—What are their vision, powers, and responsibilities? culture—What is the premise for sustainable design growth? While design process is still important, it’s now more like a hygienic requirement. It’s necessary, but not sufficient to ensure a strong design team. We need an effective design process, but to achieve great experience outcomes, a team must have shared values. Thus, to avoid a design process becoming burdensome, it should be a baseline, not a bureaucratic liability. The process will change often, adapting to the current context. Most importantly, design must be an integral part of the entire product-development process. If problems in the development process are obstructing our ability to deliver great design, we must strive to change the broader development process, in whatever way is necessary. According to Denis Petelin, a company of up to ten people is typically managed by task delegation; up to 100 people, by responsibility delegation; up to 1,000 people, by positive bureaucracy—that is, processes, KPIs, and goals; up to 10,000 people, by values and culture. While all of these management tools are necessary for companies of any size, their emphasis differs at different growth stages. It’s impractical to hire a skilled person for each specialization. … Communication gets harder, details get lost, and work proceeds more slowly. … It’s preferable for a team to comprise several people who have broader skillsets and together have the necessary combination of skills a team requires. In Part 2 of this series, I wrote about the product designer—a modern UX professional who can take responsibility for product design and is not limited to a single core skill such as research, visual design, information architecture, or interaction design. We need such people on a strong team. This is the only way to achieve solid results. It’s impractical to hire a skilled person for each specialization. The transactional costs are too high for a team of specialists. Communication gets harder, details get lost, and work proceeds more slowly. A classic T-shaped model best describes a team with this balance of skills. Brad Frost uses a nice table-legs analogy, in which several legs make the construct work, as shown in Figure 2. People have discussed M-shaped, E-shaped, Pi-shaped, and other letter-shaped models, but the principle is the same. A team requires a small group of designers, each of whom has several strong skills. The more designers skew toward being systems thinkers, the more likely they will create boring designs, while designers who are creatives are likely to create impractical solutions that are not scalable. Either of these types of designers will suffer their own limitations when they’re working alone, but they could make giant leaps when working together. Define the team’s current and future skillsets. Highlight any skills that are currently absent or underdeveloped. Create a plan for educating your current designers in these missing skills or hiring new designers who possess them. 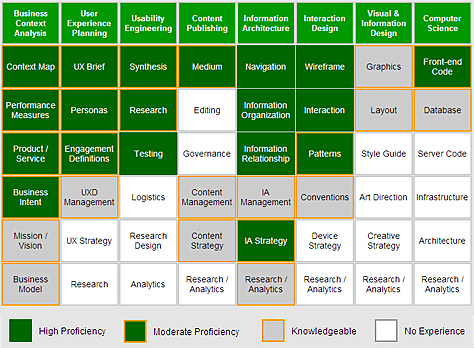 To understand the current capabilities of an existing Design team, you must assess the skills and knowledge of every designer on the team—for example, skills like motion design or heuristic evaluation—using a classic skills/knowledge matrix like that shown in Figure 3. 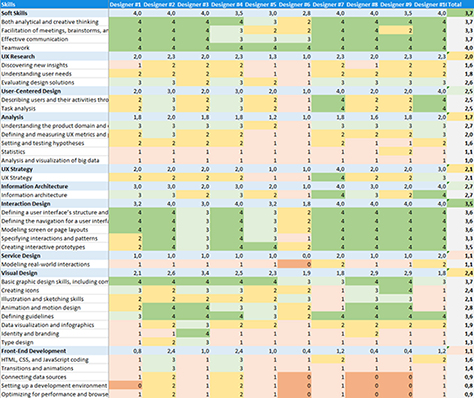 Download the Excel worksheet for this current skills/knowledge matrix. awareness—This level means having some knowledge about how a particular type of specialist works, including what tasks they perform, the tools they use, their work process, their methods and practices, and what constraints they must consider. ability—At this level, UX professionals can solve basic problems in their specialty. They can complete less important tasks once a lead specialist sets them on the right track, create mockups or prototypes leveraging existing deliverables, or update documents. expertise—Experts can successfully complete most tasks in their specialty from start to finish—often working solo. They can also solve atypical problems. leadership—Leaders can teach their skills to other team members. They help colleagues learn, achieve professional growth, and adopt new tools and methods. They also foster design cultures. Nate Davis has described a similar competencies model on UXmatters>, which is shown in Figure 4, and Paul Adams of Intercom has shared a similar hiring model, which is shown in Figure 5. To plan the growth of a UX team, we need to understand the company’s goals and product roadmaps. Our goal is to solve business problems through design. Considering current and future problems that a UX team must solve, look for people who have the specific skills and experience they need to solve them. Represent necessary areas for growth in a team profile, as shown in Figure 6. 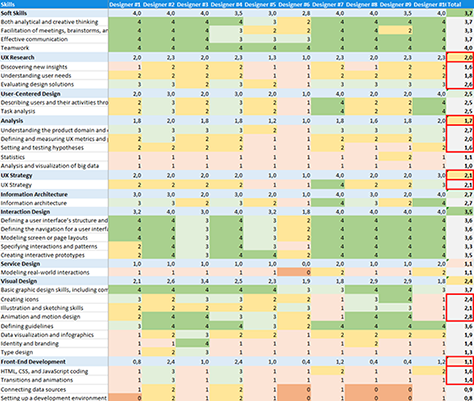 Download the Excel worksheet for this future skills/knowledge matrix. You may need to promote current team members, improve the necessary skills within the team or the entire company, or hire new designers to fill the gaps. In contrast, if a team possesses sufficient skills in certain areas, you can de-emphasize those skills requirements when making future hires. Instead, you could hire designers who have unique experience or skills that would enrich your team. Considering current and future problems that a UX team must solve, look for people who have the specific skills and experience they need to solve them. Facilitate the sharing of skills among team members. People who excel at a specific skill should mentor others on the team. Pair design and situational workgroups are two helpful methods of doing this. For example, one designer might innovate a new approach to creating application icons, which others could learn. Nick Daze offers an alternative approach, in which every designer has a professional profile describing his or her skillset. As designers’ skillsets grow, the model fills a larger area, as Figure 7 shows. 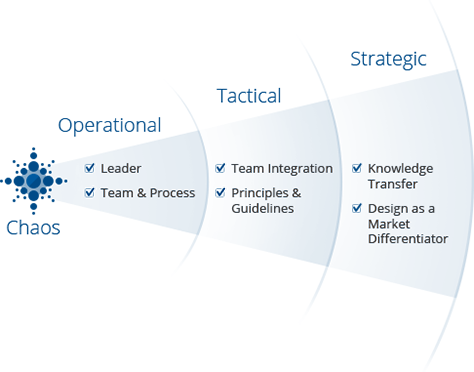 A similar model, shown in Figure 8, describes a product team comprising product managers, designers, and developers. By combining the profiles of all team members, you’ll get a team profile like that shown in Figure 9. The white spot at the center represents a combination of all three core competencies—what everyone collectively knows and can do—and indicates the true health of a team. While I attempted to use this diagram in describing my detailed skills list, it ruined my radar chart. However, this is a great approach for defining a design culture. If you want to hire great designers, you must entice them with interesting challenges and the opportunity to solve complex problems—not bore them with a generic list of skills. So far, I’ve focused on how to assess the skillsets of UX designers, but, when you’re hiring designers, job descriptions shouldn’t emphasize a list of required skills. If you want to hire great designers, you must entice them with interesting challenges and the opportunity to solve complex problems—not bore them with a generic list of skills. You’ll have plenty of time to speak about skills during a job interview or observe them during an exercise. Jay Kaufmann offers good tips for writing job descriptions. One more important thing is cultural fit. It’s super important to understand what values a new hire espouses. People’s values influence the final product, especially in young companies. On the other hand, you don’t want to build a single-minded army or sect. Hiring people who have a fresh view or approach to the work will strengthen your team. The key thing is to integrate these fresh viewpoints into a common vision, so they won’t rock the boat and cause it to sink. Many companies have set goals for their designer-to-developer ratio. While, on its own, headcount doesn’t mean anything, such ratios are another indicator of UX maturity. Leah Buley, who has done some great research on the principles behind successful design teams says the median is a ratio of 1:6. The best companies have a ratio of 1:4, and the absolute minimum for sustainable design growth is 1:12. IBM’s average ratio is 1:8. However, this ratio depends on a product’s complexity. For example, on a new mobile app team, the ratio might be 1:4. In contrast, a team working on complex corporate tools with a massive back-end might have a ratio of 1:12 overall—but, for front-end developers, an equal ratio to designers of 1:1. As IBM says, when there is an insufficient number of UX designers, developers must take on their tasks. The centralized model is similar to an internal design agency that supports multiple products. Another important issue is how to organize a UX team. 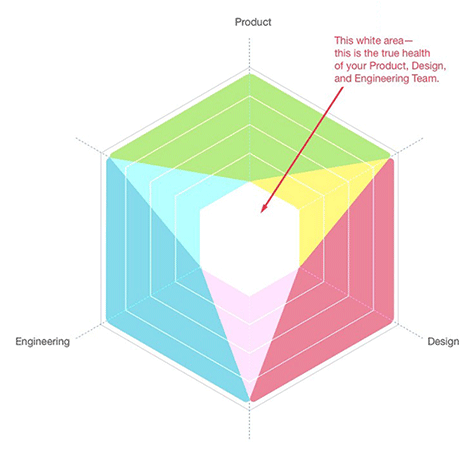 How will you include designers in a product development cycle? There are two well-established approaches: centralized and integrated. Each has its pros and cons. There is greater consistency across products because of a team’s actively sharing work in progress. Fewer people are necessary. Products evolve in cycles, so UX designers have periods of intense, then lighter workloads. As a result, one designer may be able to work on two or three products—one in its active design phase; the others, in initial planning or the development-support phase. Active information sharing within a team enables UX designers to grow professionally really quickly. Designers are in their natural environment, so they’re more motivated and easier to retain. Designers are less engaged with a product, because they aren’t collocated with a product team. Sometimes product teams must wait for UX designers to get free time, because they’re working on parallel tasks. The pros and cons of the integrated model are almost the reverse of the centralized approach. In what is a classic approach for both startups and many product companies, a designer is integrated into a product development team. The pros and cons of the integrated model are almost the reverse of the centralized approach. There is better product engagement because a UX designer is involved in all activities and details for every aspect of the product, including UX design, business strategy, and technology limitations. Quick turnaround is possible because a UX design can quickly react to every need of the development team. It’s easier if you can just turn your head and ask your colleague about something rather than trying to catch somebody who’s sitting in another room or a different building, which leads to wasted time when you don’t find people at their desk or can’t get through to them by phone or instant messenger. Camaraderie with the development team is greater. A UX designer who participates in all meetings and spontaneous discussions understands all of a project’s nuances and painpoints. A designer can do more than work just on urgent tasks and can think ahead and conduct frequent experiments. Designers grow more slowly as UX professionals because the exchange of knowledge with colleagues is patchy. It is hard to achieve an equal professional level across different teams. Designs across different products are out of sync. Communication between UX designers from different teams is less dynamic. Even if there is an outside authority, this person has less power and influence over other product teams. Individual teams make many of the same mistakes that others have already made. When a designer leaves a company, his knowledge leaves the company with him, and the team lacks necessary design skills until they hire a new designer. This risk is high because designers are prone to burnout and get demotivated when they’re working outside a familiar environment. Many managers don’t know how to work effectively with designers, which heightens this risk. Once companies have grown extensively, there is often no logic behind choosing a specific team structure—centralized or integrated. It’s often just a matter of what’s existed historically. As a result, companies may change from one structure to another during optimization efforts. Some companies change their structure regularly, but this is hardly a good practice. Moreover, big organizations may have a mix of team structures in different departments. For example, UX designers may be a part of a product team, while a UX research team may work as a centralized agency. The centralized and integrated models have their pros and cons. But what if you took the best of both worlds? With that goal, some companies are taking a distributed approach to structuring their design teams…. As I’ve outlined, the centralized and integrated models have their pros and cons. But what if you took the best of both worlds? With that goal, some companies are taking a distributed approach to structuring their design teams and managing design expertise overall. This basically means applying a matrix management system to design. A designer is on a product team, working closely with a product manager. 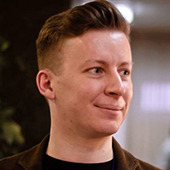 He is also part of either a functional UX team that has its own manager or a workgroup of designers from different teams. How does this model work? Designers are part of a product team and sit with them. This allows them to understand the product deeply, react quickly to all the needs of the product team, and amass the credibility to make difficult decisions. Great designers contribute at all levels—satisfying user’s needs and business goals; creating design mockups, prototypes, and high-quality implementations; devising product and content strategy; and producing outcomes such as smart marketing, caring customer support, and brand amplification. Designers should work tightly and directly with all multidisciplinary specialists to build horizontal connections. That's the only way to differentiate the final product in the market. Maintain team spirit. Don’t punish each other or create conflict situations behind each other’s backs. Be ready to step into the breach when a designer on another team leaves the company. The resulting tight collaboration with UX designers from other teams will provide many designers’ first management experience and help them to grow their future career. Temporary teams with a specific skillset can gather together to solve a complex problem, allowing them to handle cross-product tasks quickly, without requiring any organizational restructuring. A situational workgroup, working on a cross-product task, can be a powerful tool for rapidly solving challenging problems that affect multiple product teams. Temporary teams with a specific skillset can gather together to solve a complex problem, allowing them to handle cross-product tasks quickly, without requiring any organizational restructuring. A UX designer isn’t tied to a particular workplace, but can work on a product team or collocate with other designers to solve cross-product problems. A workspace should help specialists to work effectively and creatively on either a product team or a functional team. Teams need a lot of common space for discussions and brainstorms, concept modeling and ideation, creating mood boards, demonstrations, and sharing ideas. Lots of joint activities between a company’s UX designers helps them to stay true to their professional context, stay motivated, and create shared values. There are many activities that encourage friendships, including knowledge sharing, parties, cross-product unification projects, and brainstorms on the future of products. Let’s sum up the pros and cons of distributed teams. Now, I’ll summarize the pros of distributed teams. When a UX designer is part of a product team, he understands both the team and the product better. Cross-functional collaboration is more intense, so a designer gains more credibility and authority and can react faster. Product lines are more consistent. A team develops a common visual language and the different product teams are in sync. This allows an interesting, fresh, dynamic collaboration approach for designers, who love everything new. Here’s a summary of the cons of distributed teams. Highly skilled design managers are necessary to make this approach work. Product managers must support this approach. They shouldn’t take over 100% of a designer’s workload. A company must already have attained UX maturity, created effective work processes, and acknowledged the importance of design. While this isn’t enough to ensure the success of geographically distributed teams, it will help. There is also tension between product tasks and product-line unification efforts. Depending on what team a designer is currently working with—a product team or a design team—his implicit priorities will change. At that moment, he considers that workgroup to be more important and gives it more attention. If a manager were to tie a designer’s salary to a product team’s overall results, this would become a constant source of employee dissatisfaction. What about KPIs for designers? The simple answer is: they don’t work. Most employees influence product launches only indirectly. They aren’t fully responsible for the business results. If a manager were to tie a designer’s salary to a product team’s overall results, this would become a constant source of employee dissatisfaction. A designer could be punished for other people’s failures. This would result in an artificial construct that does more harm than good. However, for a designer who has some management responsibilities, KPIs could work. You could track team-health indicators such as plan completion. Plus, for a specific designer, it can be useful to monitor professional growth, quality level, complaints, and the willingness to work a few more hours to ship a great product on time. But these are just the things a good design manager should consider. You don’t need any KPIs. Empathy within a team helps us to listen and understand what our teammates do. Embracing uncertainty on projects and in workspaces simplifies experiments and helps us to search for new solutions. Following patterns glues individual initiatives together. Jim demonstrated jazz improv in his magnificent TEDx talk, “Jazz Improvisation for Radical Collaboration,” which you can see in Figure 10. Baruch Sachs talks about similar ideas to Jim’s. Despite all the time we spend doing strategic planning for our work, we still end up having to improvise because of changing environments, technologies, and circumstances. Many companies seek unorthodox design-team collaboration approaches. Next, let’s look at some examples. 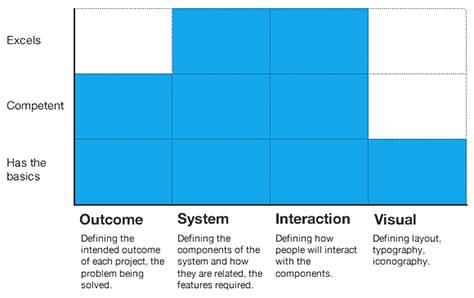 The best approach to structuring a distributed design team is a matrix model. However, making this work requires a company-wide effort. Squad—This is a small, cross-functional team that is responsible for a part of a product—for example, the recommendations block in an app. 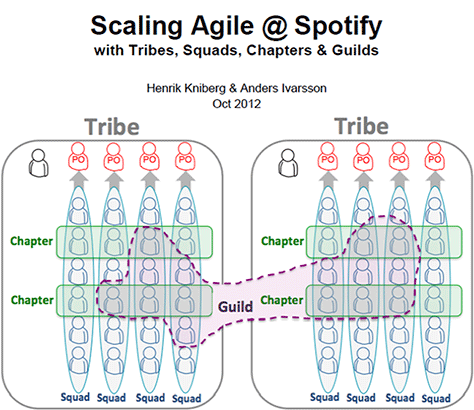 Tribe—This is a collection of squads that work in related areas—for example, the music player or back-end infrastructure. Chapter—These are people who have similar skills and work within the same general competency area—for example, UX designers. Guild—This represents a community of interest across the whole organization—for example, Web technology. The chapter lead—for example, in design—is a line manager for his chapter members, with all of the traditional management responsibilities, including developing people and setting salaries. However, the chapter lead is also part of a squad and is involved in the day-to-day work, which helps him stay in touch with reality. Each guild has a coordinator. The product owner is the entrepreneur or product champion, who focuses on delivering a great product, while the chapter lead is the professor or competency leader, who focuses on technical excellence. There is a healthy tension between these roles because the entrepreneur tends to want to speed things up and cut corners, while the professor tends to want to slow down and build things properly. Both perspectives are necessary—that’s why it’s a healthy tension. The company has two types of teams: functional teams—for example, profile, media content, and search—and platform teams—for example, Web, Android, and iOS. Both types of teams should align on any update to the product, so a feature works similarly on all platforms and follows platform guidelines. At Adobe, the Photoshop team is broken into full-fledged teams that are responsible for a specific feature and are called molecules. They consist of designers, engineers, and managers. This team structure became necessary when Adobe moved to a subscription-service model, with quick iterations rather than big-box releases every one or two years. Photoshop users are very diverse, including photographers, graphic and product designers, and other creatives. So user researchers needed a quick way of getting feedback from real users. Product designers have access to user groups in Slack and Facebook, so they can test their ideas and look for unsolved problems. [At FiftyThree], user experience is at the same level as business objectives. Now, let’s look at some examples that show how multidisciplinary design teams can be most productive. When the company was founded in 2008, Aaron Walter was the lone designer and did everything from UX and visual design to front-end engineering to user research. This helped him to envision a perfect, multidisciplinary design team that reduces transactional costs. In 2015, MailChimp’s UX team comprised twelve people—four user researchers, two product designers, four front-end engineers, one newsletter designer, and a manager. According to The UX Reader, the UX team is mobile, and its members often work in Engineering, Marketing, or with other teams to solve a problem. There are guest spaces in their office, and they invite industry experts like James Victore and Brad Frost to work with them, providing inspiration to the team. Plus, all MailChimp employees work in user support for a day or two. All of this stimulates interdisciplinary collaboration and helps to improve their products. This company makes the popular app Paper for drawing on iPad. It has an infamous, engaging user interface that defies traditional interaction patterns. To make the app’s novel interactions work, three skilled designers with an engineering background experiment constantly. The user researcher’s role is also critical because they not only test new interaction patterns with users, but also identify unsolved problems. It’s possible that the company’s founders brought this culture from Microsoft’s Pioneer Studios where they worked on the Courier tablet concept. Co-Founder Andrew S. Allen says that Paper has a very equal engineer-to-designer ratio, but they’re not a designer-centric company, as many would say. It’s just a place where user experience is at the same level as business objectives. Last year, Halfbrick studio eliminated designer as a role and fired its final two designers. The company’s leadership said that good design is the company’s focus and should be everyone’s responsibility, including artists, engineers, and other employees. This may seem controversial, but this is an important change in the company’s culture, and the hope is that it will lead to better products. To make this new approach work, they have a design coach. Using a centralized model with sub-teams provides a great starting point for building distributed expertise within an organization. At Groupon, the design team is centralized, but includes sub-groups for key areas such as Web, mobile, and marketing. Each designer is assigned to specific projects. 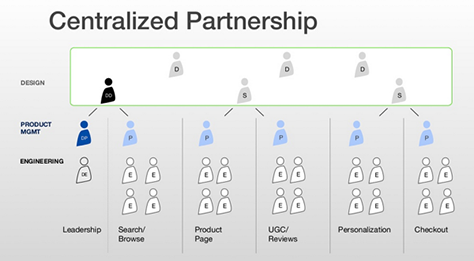 They call this model, which is depicted in Figure 12, a centralized partnership. My portal UX team at Mail.Ru Group adopted this model a couple of years ago. Designers don’t have Senior or Junior titles. The company evaluates someone’s seniority based on their input to a project or product and believes titles can limit and demotivate. Nevertheless, some designers focus on the visual side while others focus on prototyping. But they’re all called product designers because they all influence the product. Having a separate design-infrastructure team that is responsible for building a design system and distributing it across product-design teams is also a great way of building and nurturing a design culture across an entire organization. The company formed a small design task force called UXA while working on its first massive redesign in 2013—Project Kennedy, with which their signature flat design style was born. In developing its strong concept of Material Design, this team worked with designers from specific products in implementing this vision. Now there’s a two-way connection between the visual-language and product-design teams: designers in the field bring fresh patterns and ideas to the common language. IBM is currently undergoing a global transformation of the company and has invested $100 million in design, hiring about 1000 designers. The company currently employs about 350,000 people, so it’s impossible to build a centralized design team and expertise. They bet on a design incubator in Austin, Texas, which is responsible for defining work processes, visual language, and education. Their key goal is to improve overall design culture, sell design values to managers at all levels, and run workshops to transfer knowledge and experience to non-designers. Mentorship is key. The design team at this publishing house has tried different structures—from dedicated vertical teams; to a centralized, company-wide team; to a mix of the two, as shown in Figure 13. These changes are typically prompted by day-to-day problems within the current phase in the company’s lifecycle. As soon as they solve their big problems, older systems become ineffective. As a result, tools and apps teams are now centralized, while designers for specific Web sites are embedded in development teams. They have a healthy collaboration, as Figure 14 shows. Embedded designers experiment a lot, then the Tools team abstracts successful patterns and makes them reusable. To keep this collaboration tight, they do daily standups, weekly retrospectives, regular code reviews, and design critiques. Nathan Curtis from EightShapes compares three models for managing guidelines, as shown in Figure 15: solitary, centralized, and federated. The last one is the best, but it requires a tight collaboration between teams. Some companies have achieved success by differentiating on design because of the close relationship between the company’s CEO and design leadership. While details about Apple’s organizational structure are scarce, industry has long considered the tight collaboration between CEO Steve Jobs and Chief Design Officer Jony Ive a key ingredient of their success. They build an astonishing vision of a perfect design, then align product work around it. Interestingly, Olivetti and Braun are two older companies that have also relied on this approach. However, this collaboration model is overly dependent on personalities and charisma, making it difficult to sustain or scale. Over the past few years, some of the best designers in our industry have partnered with venture funds—for example, John Maeda, at KPCB; Irene Au, at Khosla Ventures; Jeffrey Veen, at True Ventures; a group at Google Ventures, and others. They work closely with funded startups and help them with UX strategy—from hiring to processes to specific product-design decisions. More and more companies are experimenting with holacracy, a nontraditional structure that essentially eliminates managers and has had mixed success. Valve, Medium, and Buffer have successfully adopted this approach. Nuances of their team organization include total self-organization, a department structure, and mentorship. However, Zappos has had problems implementing holacracy, with 14% of employees leaving the company within weeks of its introduction. The idea of this approach is to get rid of ineffective management. But sometimes the baby gets tossed out with the bath water. A good manager is a leader first and foremost, who helps his or her team to grow and improve. It’s often hard for employees to set and track their own goals or understand what the company expects from them. 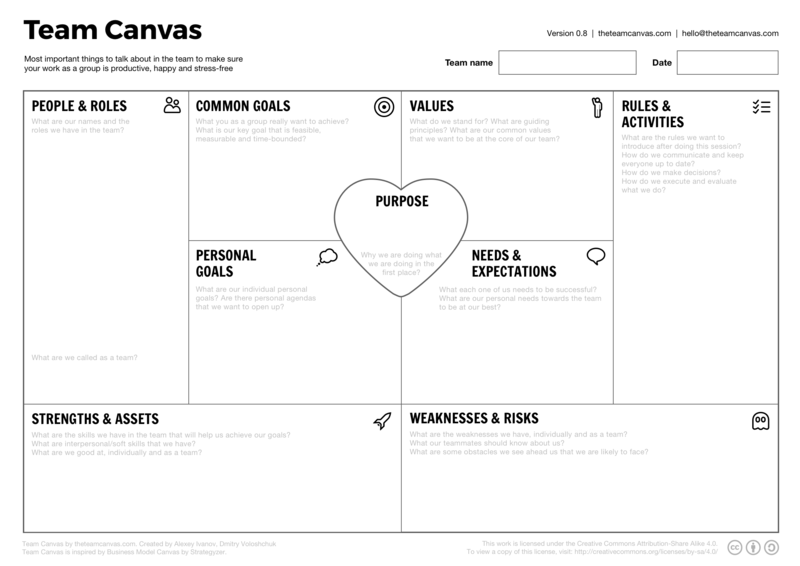 Alexey Ivanov and Mitya Voloshchuk have proposed a model for healthy team collaboration that is similar to Alexander Osterwalder’s Business Model Canvas. Their Team Canvas tool, shown in Figure 16, helps you to understand who you are and where you’re going. Use it to analyze your team and choose an appropriate collaboration model. Download the full-size version of the Team Canvas. We need different structural models and strategies for different levels of UX maturity within a company. We need different structural models and strategies for different levels of UX maturity within a company. In the beginning, it’s hard to achieve results without a somewhat authoritarian approach, in which the design team takes responsibility for all design activities. But, at that point, there are usually too few designers and work processes aren’t yet working efficiently. However, as UX maturity grows, it’s better to move to a distributed-expertise approach and involve the entire company in design decisions. Initially, it’s hard to launch a distributed-expertise approach. It’s necessary to set up basic processes for task management and quality assurance, define a visual language, build trust between product and top management, and expand design culture. We need design leaders who realize the importance of a distributed approach and can implement it, while also understanding the peculiarities of a company’s business and organizational structure. In Part 2 of this article, I’ll discuss two other key areas of focus for User Experience: leaders and culture.